Hugh Holland: Silver. Skate. Seventies. 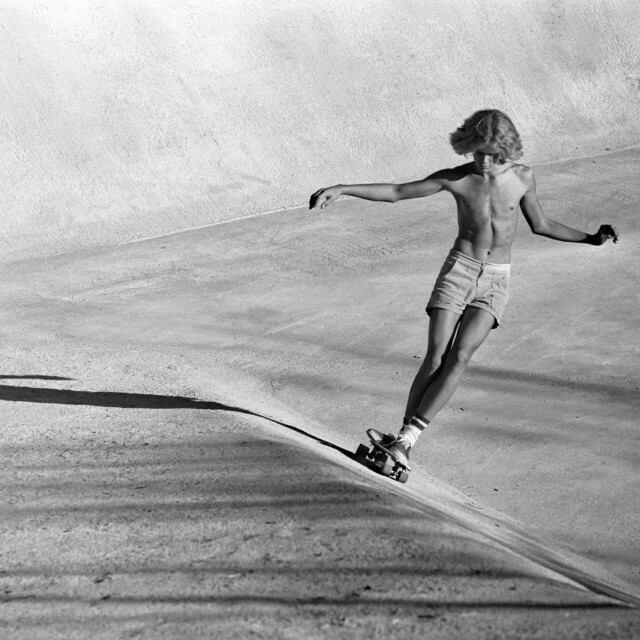 On a late afternoon in 1975, a young photographer named Hugh Holland drove up Laurel Canyon Boulevard in Los Angeles and encountered skateboarders carving up the drainage ditches along the side of the canyon. Southern California was experiencing a major drought. Emptied suburban swimming pools became evaporated playgrounds for kids with wheels—kick-starting an explosive skateboarding scene. "It spread like wildfire all over Southern California," says photographer Hugh Holland. "I know it happened in other parts of the world too, but California felt like the center of it all." Immediately transfixed by their grace and athleticism, he knew he had found an amazing subject. Although not a skateboarder himself, for the next three years Holland never tired of documenting skateboarders surfing the streets of Los Angeles, parts of the San Fernando Valley, Venice Beach and as far away as San Francisco and Baja California, Mexico. Hugh Holland: Silver. Skate. Seventies., adds a more raw, spontaneous understanding to Holland’s well-known color photographs of the 1970’s skating scene. Though now he is most closely associated with his later work in color, the artist began his photographic documentation of the skateboard revolution shooting in black and white. Holland shot these negatives while experimenting with new ideas and often for his own enjoyment. These early black and white images were in many ways the genesis for his later color works—providing us with a rare glimpse behind the creative curtain. Hugh Holland (b. 1942, United States) had no formal training in photography prior to picking up a camera in 1968 after returning from a trip to Spain. He made a dark room and began shooting everything around him, particularly people. Holland’s work was first exhibited at M+B in 2006 and again in 2010. Following the success of these shows, his exhibitions have traveled to Paris, New York, Istanbul and England. A monograph of the artist’s color images, Locals Only by AMMO Books, was published in conjunction with M+B in 2010.